I am retraining a 16 point commander from one of my CVs to command the Fletcher. I am new to the Fletcher. Which are the most important commander skills? I have her set up with Main Armaments, Damage Control, Aiming Systems, Propulsion 2, Steering Gears 3, Main Battery 3. Should I change any of these? Is the Fletcher best played as guns first or torps first? I played the Mahan until I got some experience. I just skimmed past the others to get T9 for ranked. I know people in Ranked will yell at me for my lack of experience but I only want to complete the first level. The Fletch is a good jack of all trades boat. It can be a AA DD, a torpedo boat, a gun boat. Really depends on your preference style of play. Personally, the torp set up is my preference. @Capt_Ahab1776 I upgraded the torp speed and range. But I am terrible at being detected and killed in the first few mins. Should I hold back even if others yell at me? "Can't be a help if your dead." My go to DD sensai gave me that helpful advice. It rings true. 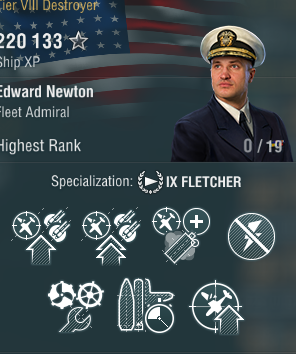 The Fletch being a T9 will almost always face radar cruisers. A general rule of thumb for me is dance near the edge of their radar range if there is no way to hide or get a kill shot. Use caution at the beginning of the game. 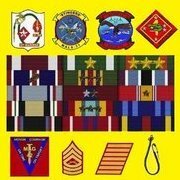 The longer you live, the more valuable you as a DD captain becomes. Put your last three points into SI. Notes about the build: With the CV meta I do run some AA upgrades to go with DF, it’s just a case of going with the meta. I also run the stock GFCS. I don’t spend much time shooting things at max range, I’d rather have the smaller concealment window to make sneaky play with most DDs with slow shell speeds. Feel free to ask me any questions about it. 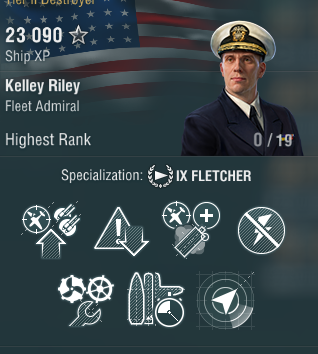 I'm also completed my third Fletcher 19-point captain that will be specialized in torps. The below attachments are for AA and seeking/ contesting cap zones.